This cute Thumbprint Shamrock Keepsake Frame is a really fun and easy to make St. Patrick’s Day Kids Craft Project! This is a really fun and easy kids craft project! You can easily swap out the graphic in the middle to use this craft idea for any holiday or special occasion during the year! It would work well for pre-school, kindergarten, or early elementary aged kids. For younger kids, you’d need to provide a bit more assistance, while the older kids could show their creativity with more independence. Materials Needed: (Amazon Affiliate links included to show you specific examples of materials. Please refer to my disclosure policy for more information). Wood Craft Colored Sticks – I included a link to the pre-colored sticks, for simplicity and ease of use. If you have extra paint on hand, or are making multiple of these, it might be more frugal to purchase plain craft sticks and paint them yourself. It would add an extra step to the process, but if you click the links you’ll see that 750 plain sticks is less expensive than 150 colored sticks. Dip your child’s thumb or finger in the paint. Press down the finger onto the paper to create a heart shape. Do this 3 times, slightly overlapping each heart, this will create a shamrock. (refer to photo above). Sprinkle glitter onto the painted shamrock while it is still wet. It will adhere when the paint dries! Arrange the craft sticks by color of the rainbow 3 on the top and 3 on the bottom. Place two craft sticks on each side and glue them together. I used my glue gun for this, because it’s what I had on hand. If making at school or for a kids party, craft glue would work fine, and be safer with small children around. You could always glue the sticks ahead of time as well, and let the kids use their glue for the steps remaining. Cut the Shamrock from the paper, glue it onto the back of the frame. Glue a piece of yarn onto the back to hang! Adorable idea, this would be a fun activity, & a treasured gift to anyone who’d receive one. My grandsons would love this project. I’m passing this on . We can never resist a good popsicle stick craft project. Always so much fun! This is so precious! I love handmade artwork from my kids. ALways makes me smile. This is super adorable! I love how easy it looks and how great it turned out! Cute and fun and a good memory. Great kids craft idea for teachers and parents! 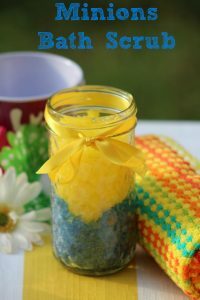 Such a wonderful projects to spend an afternoon doing with the kids and it would make such an adorable keepsake to give to the grandparents. So cute for little kiddos. I wish my kids were young again so I can do fun things like this with them. Great project and looks so easy for kids to do! This is so precious. My little one isn’t so little anymore but I still have all of the projects like these that he made me. They’re so fun to work on together. What a cute idea, I am sure my grandchildren are going to love to make one of these. Love the rainbow affect on these . This looks like a really fun craft to make! Thanks for posting! I can see the kids loving this. Our playgroup is having a St. Patty’s party this week and this would be a fab idea!! I think i made something similar to this when I was a kid. Its super easy and cute!! What a cute idea…and perfect for so many ages so it’s a nice family activity! I love craft sticks…so much you can do with them! Looks easy and fun for the kids. What a cute idea and a wonderful keepsake! This is precious! I love the rainbow popsicle sticks too! this seems so obvious but ive never done this one! so cute! I love this idea. My grandson could make this to give to his great grandma. Her birthday is on St. Patrick’s Day. I like this craft project. I am going to try to make this with my nephew next weekend. I love the handprint and fingerprint crafts as well. My son is nearly 30 and I treasure his little handprints! I really like this! Will be great for my homeschooled grandchildren to do. Thank you so much for sharing it with us! This is such an adorable craft, I never would have thought of it. I would use a lot of orange and pink in the frame. That comes out so cute. And pretty easy to do. oh my goodness, so cute!!! I will definitely be doing this with my two kids! Would make a cute gift for grandparents too! What a cute project. I really love all the bright colors, too. This looks like such a fun and adorable craft. I love it. I would love to make this craft with my niece. So adorable!! What a cute little “good luck” keepsake this would make!! That is a very cute project. I’m going to do these with my grandchildren. This would be fun, and we always love popsicle stick craft projects, because we love popsicles, lol. This is cute. I used to love popsicle stick crafts when I was a kid. This is such a great idea! It is fun for kids of all shapes and sizes to use their own thumbs to create a work of art! Very cute craft. I like the colorful frame. You could use popsicle sticks for the craft sticks. I love that the clover is made from thumbprints. Cute idea! that is such a cute gift idea! love it!